REUTERS/Gary CameronUnited States Secretary of Defence Chuck Hagel (L) listens as U.S. President Barack Obama meets with military senior leadership to receive an update on the campaign to combat Islamic State, also known as ISIS and ISIL, at the Pentagon in Washington October 8, 2014. Defence Secretary Chuck Hagel has tendered his resignation and is set to announce his resignation alongside President Obama at 11:00 a.m.
Hagel has been the Secretary of Defence for almost two years after being sworn in on February 27, 2013. During his tenure, Hagel has been characterised as an invisible man who was content to work behind the scenes. As Secretary of Defence, Hagel has faced a multitude of challenges and has suffered from a less than glamorous track record of successes and failures. Below are some of the major events of Hagel’s time as defence secretary. Hagel said that North Korea presented a clear and real danger to the US after expectations that North Korea may launch a missile test. The declaration occurred simultaneously with the movement of a US missile defence battery to Guam. North Korea carried out a missile launch the following month. Egyptian General Abdel Fatah al-Sisi launches a military coup against the democratically elected Muslim Brotherhood government. The coup took place despite Hagel’s warnings and consultations in the days leading up to the event. 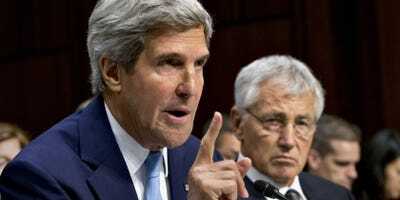 Hagel told the BBC following a chemical weapons attack by military forces loyal to the regime of Syrian President Bashar al-Assad that the US was ready to launch retaliatory strikes against Syria. Obama put the decision to Congress and the strikes never occurred. Russian forces quietly invaded and annexed Crimea, prompting a quickly elevating cross-border conflict in Ukraine and eastern Europe. NATO allies in the region have been uneasy ever since. On a trip to Japan, Hagel said he welcomed Tokyo’s steps in amending its constitution to allow for collective defence agreements. This support of Japanese militarization led to increased tensions with China, which is deeply opposed to a resurgent military power in Tokyo. The White House performed a prisoner swag with the Taliban in order to win the release of US soldier Bowe Bergdahl. The US traded give Taliban prisoners from Guantanamo Bay to win Bergdahl’s release. The prisoner swap was immediately criticised as Bergdahl may have purposefully deserted his post prior to his capture, and the White House failed to notify Congress thirty days ahead of the exchange as is required by law. US special operations forces carry out a daring attempt to free Steven Sotloff and James Foley, two American citizens held captive by the Islamic State of Iraq and the Levant (ISIS). The raid failed to free the captives, who were both executed by the terrorists later in the summer — although its existence was leaked in late August as the fight against ISIS heated up. Hundreds of US soldiers began to fly to Liberia to fight the rapidly expanding Ebola epidemic in western Africa. Thousands more were expected to be deployed afterwards. 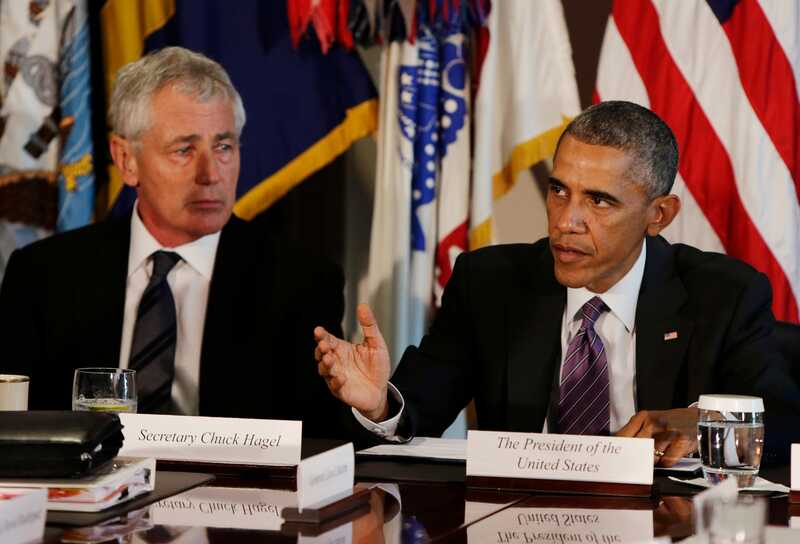 Hagel was at odds with the White House at times during the response. The White House secretly ordered a continuation of military operations in Afghanistan, despite assurances that the US’s military role would end in the country by 2014. Hagel resigned three days after the decision to continue the war in a sign of possible contention with Obama. 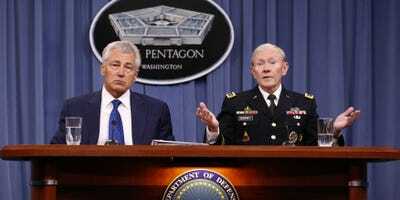 # of people in the Pentagon upset about Hagel leaving? Three, maybe four. Now that we know how Gates and Panetta felt about him, Obama is 0-3 in bonding with his SecDef. A significant observation given the range of crises that occurred over the last two years is that Hagel has been criticised for being inarticulate. The New York Times noted that Hagel was often overshadowed by both Secretary of State John Kerry and Chairman of the Joint Chiefs of Staff General Martin Dempsey. The following compilation video from The Washington Free Beacon highlights Hagel’s general reticent style during questioning.